The Indian state of Kerala is blessed with natural marvels, which make it one of the most beautiful tourist destinations across the country. Travelers from all over the world are interested in Kerala holidays as these take them close to nature. From pristine backwaters and sprawling beaches to isolated hill stations and exotic tea plantations, the state excites every visitor with its wide array of delights. Situated along the vast coastline of the Arabian Sea, it boasts of having the finest beaches of India. Owing to this fact, beach tourism in Kerala has seen a huge rise in the past few years, making it one of the favorite beach destinations. This time I was looking to go to a place where I could spent the time in peace. I was in no mood to cover many places in stipulated amount of time. The idea of this vacation was to relax and rejuvenate. Varkala has been on my list for quite a time and 4 days break was apt for it. A captivating beach town located about one and half hour’s drive from the state capital Thiruvananthapuram, Varkala is a heartening mix of beach beauty and devotional ambience. This is perhaps the only location with a cliff-land-sea combination. Here steep cliff and flat land adjoins the Arabian Sea, a peculiar geography! After spending numerous hours on planning and search on internet, the itinerary was finalized. We planned to reach Varkala from Hyderabad via Trivandrum. One can reach via Cochin too but its closer to Trivandrum. 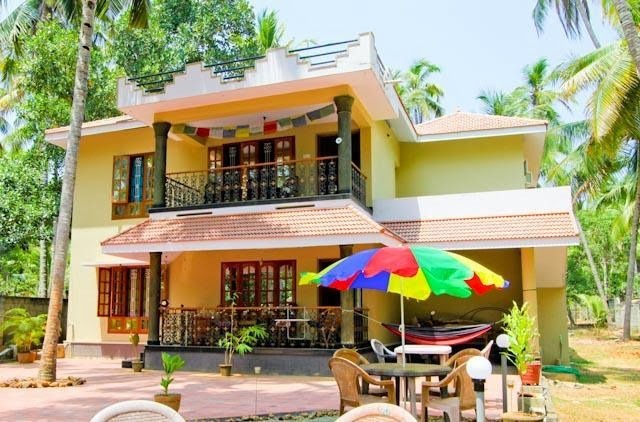 We booked one of the guest house in Varkala in advance. On the D-day , we reached Trivandrum in the evening. The weather gods were happy and it was drizzling that time. We took a taxi from the airport itself and set course to Varkala. It took us almost 2 hrs to reach the place. Our guest house was located 5 minute off the main road. The location was perfect for a peaceful stay. It was a traditionally kerala house with a wide backyard, coconut trees, garden in front and so colorfully painted. I was just in love with the location of guest house and the ambience. Varkala beach waters are also enriched with mineral water springs; believed to possess medicinal values. It is regarded that a dip in these waters washes off all the sins giving the seashore an apt tag 'Papanasam'. Neighbored by the sacred Vaishnuvite shrine Janardhana Swami Temple this location is of high reverence for the Hindus who perform ‘Vavu bali’: ritual for the liberating their ancestors’ souls. Holistic atmosphere coupled with soothing waters is fast turning Varkala to a key Ayurvedic treatment centre. Ø Authentic ayurvedic massages at reasonable cost. The weather was quite sunny in the day time. By the afternoon it became overcast. After delicious morning breakfast at the guest house , we decided to explore the cliff area. We got all the information of the place by the owner’s of the guest house. This guest house is being run and managed by two Spanish ladies Katrina and Esther. Just amazing human beings. On one of their visit to India , they just fell in love with the place and decided to do something here only. Rest as they say is history. We decided to have lunch at one of the restaurant at cliff as the guest house was just 5 min walking distance from there. The view of the cliff and the sea was absolutely breathtaking. Light drizzle and the breeze was icing on the cake. We spent the entire evening on the cliff and strolling down towards the beach. The scenery , weather and calmness did not let us go back to the guest house. There are many restaurants of all types at the cliff. It is also a small shopping hub for the tourists. One will find all the handicraft items and local items of Jaipur, delhi, tamil nadu, Maharashtra and of course kerala. The prices are no doubt on the higher side but bargaining is the key. Early morning & Evening walks on cliff watching sunrise and sunsets. Hire a two wheeler and roam around. Yoga and massages. Free yoga classes at the cliff . Swimming and surfing. Towards the south of the cliff is the famous Papanasam or Vakala beach. Shree Janardhana Swamy temple is also situated there (Open 0400 – 1200 hrs, 1700 – 2000 hrs). This 2000 years old temple is dedicated to Lord Vishnu and Hanuman. It is one of the famous hindu temple in the south. All the males have to remove their t-shirts/shirts while entering in the premises of the temple. On the north side of the cliff is the Evada beach and Black beach. One of the cleanest beaches as they have not been explored much. The black beach has very soft black sand. Further north is the Kappil beach, where sea and backwaters run parallel divided by a more-than-one km of straight road. Perfect place for sunbathing and swimming. The Priyadarshini Boat Club here offers boating facilities. Anjengo Light house and Fort: (south of Varkala) Originally built by the Portuguese as a depot to store merchandise. It was converted into a fort by the British. Sandwiched between the sea and the backwaters. One is permitted to climb the light house and have a majestic view of the city. Trivandrum city can easily be spotted when sky is clear. Check for the opening timings for heading for it. Ponnumthuruthu Island/ Golden island: (15 km south of Varkala) A delightful getaway surrounded by the Anjengo backwaters. This uninhabited isle is accessible by boat from the makeshift jetty at the nearby Nedunganda Village. A 100-year-old Siva-Parvathi Temple, rebuilt a decade back, is situated here and the entire island is temple property. We were not able to visit this place due to time constraint. Free Wifi available at all restaurants ! To be frank you would not see so many foreign tourists at one single place as I saw in Varkala. You hardly find any Indians other than the locals who run the shops and the restaurants. Do not expect the markets to shut down with the sunset as the night life is simply amazing, and it goes on till midnight. All the shops remain open and the restaurants display their fresh catch for the day to tempt the tourists in the evenings. Drinking beer and having the sea breeze hit in the dark of the night, with some music in the background, can’t be described in words.. The restaurants are quite expensive but never restrict yourself from exploring the delicious sea food. They do have live bands and they keep playing and dancing till midnight. This is one place you should go to if you want to just laze around. The feel of going back home would never be there. I just did not feel like leaving the clear blue waters & the fine sand. I just wish that the beauty and calmness of this place doesn't get lost with greater influx of tourists. Be a responsible and eco- friendly traveler. About the Author Ashish Jain: I'm 29 years old guy who hails from city called Meerut. Its about 70 kms from Delhi and has historical importance related to Independence revolt of 1857. I did my schooling from itself and later completed my B.Tech from Vellore. Travelling was not my passion until mid-term of my college and later it became my interest. The place of travel is very important to me. My idea to visit a place is where I get to see and explore something new. A place which is either rich in heritage or has amazing natural surroundings. Personally I avoid going to very commercialized tourist places. Cycling and motorcycles are my other favorites. Presently, I'm living in Hyderabad from past year and working as a First Officer in Indigo.